I have found working with spandex to be a continuous learning process. It is good to learn about the properties of different types of spandex so you can plan for what you want to get out of your garments. One of the main differences between different types of spandex is the weight. The given weight of a spandex corresponds to how thick it is. 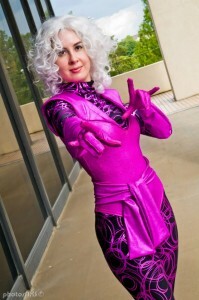 Personally I generally prefer thicker spandex. Thicker spandex is a bit more forgiving and helps hide lines from undergarments. I have some friends however, who work out a lot and prefer their suits be made out of thinner spandex to help show off their definition. 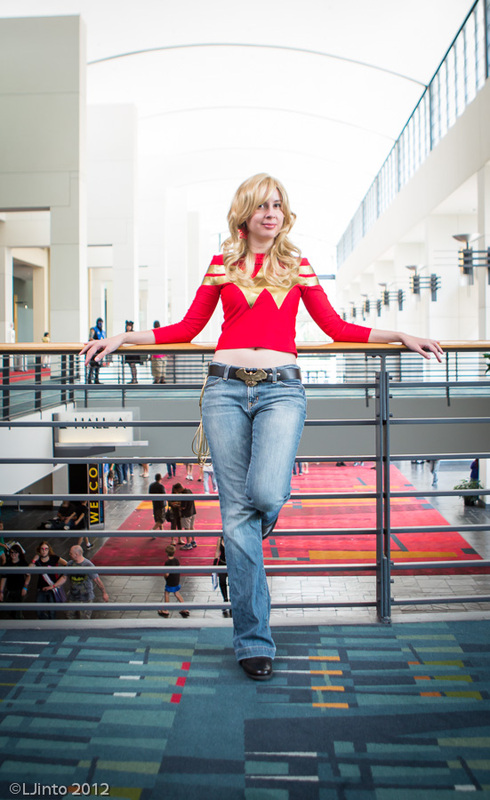 Another main characteristic to consider is which way a spandex stretches. Some spandex comes in both 4 way and 2 way stretch. You’ll get a stretch both vertically and horizontally with 4 way, but only in one direction with 2 way. Generally it will be easier to accommodate for your garments having a 4 way stretch. With a 2 way stretch you will need to pay closer attention to fitting and make sure you also use spandex with 2 way stretch to make your mockup. 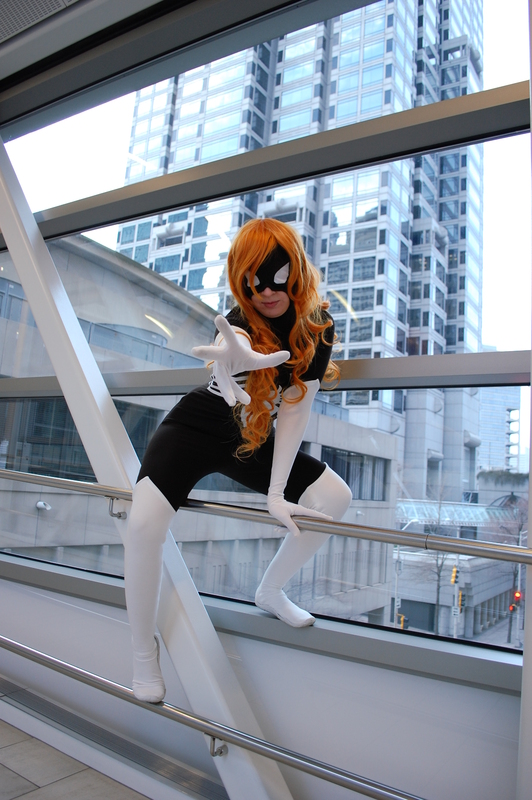 The following weight information I provide, along with my pictures and experiences with some different types of spandex, comes from Spandex World. Milliskin is a thinner spandex at 6oz/square yard. You can get it in either a shiny or matte finish. With it being thinner I personally would not want to make a whole bodysuit out of it. 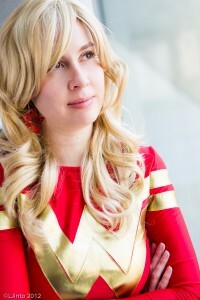 I did use red matte milliskin to make my Cassie Sandsmark Wonder Girl top. 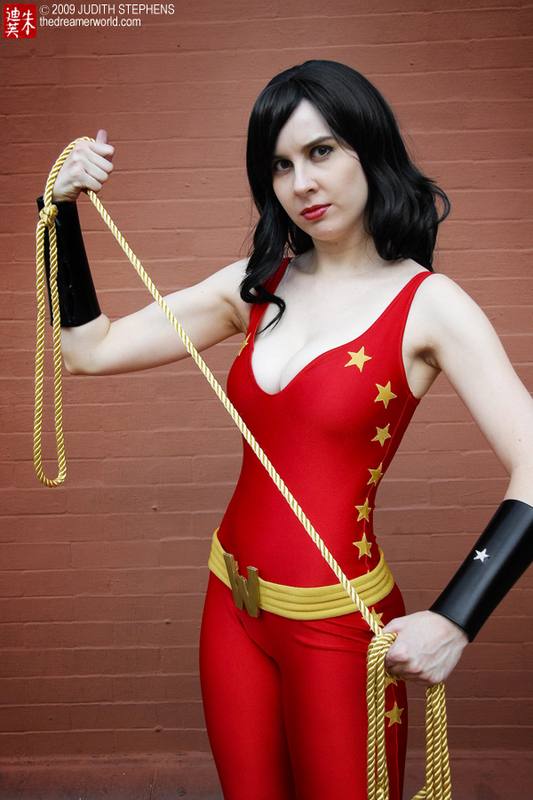 I used shiny gold milliskin for the gold stars on my Donna Troy Wonder Girl as well as the outer fabric for the belt. Wet look spandex is 5 oz/square yard and has a slightly shiny wet look. This can add an interesting effect to garments. 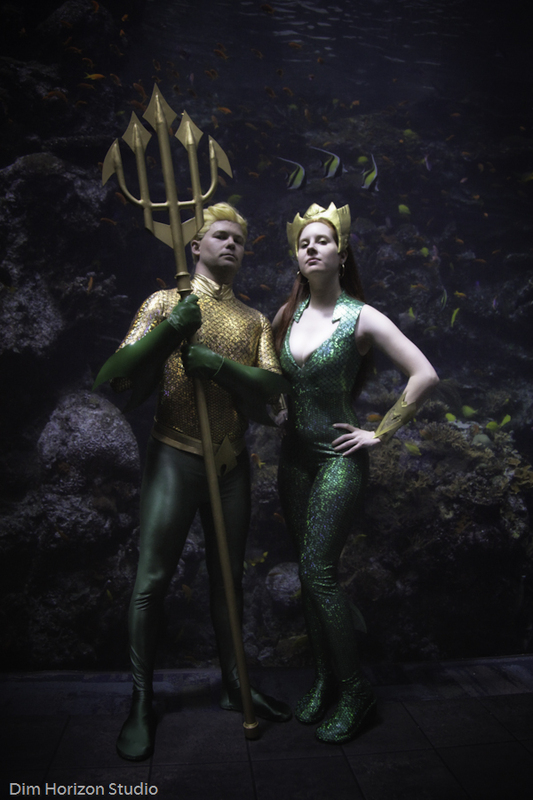 I used wet look for Aquaman’s pants since I thought that would be a nice effect for an aquatic character. Moleskin has a weight I like at 8 oz/square yard. I used matte brush finish moleskin for Spider-Woman, and my suit is very comfortable. However, the black moleskin was very full of dye. Even though I pre-washed it I still had problems with the black bleeding onto the white when washing the suit. To avoid this now I hand wash the suit as normal, tumble dry it until it is just damp and no longer very wet, then hang it to dry the rest of the way. This way gravity can’t pull water with black dye in it down through the white parts of my suit. My white moleskin was also not as opaque as I would have liked. 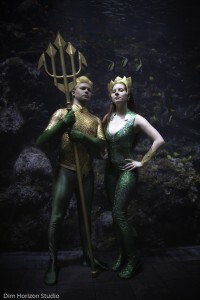 I layered the legs of the suit with another spandex to make them more opaque. Spandex with metallic finish is going to be more delicate as far as wear and tear goes. The finish on metallic spandex will wear off with use. I would not want to use metallic spandex for a whole suit but I do like to use it for accents and accessories. 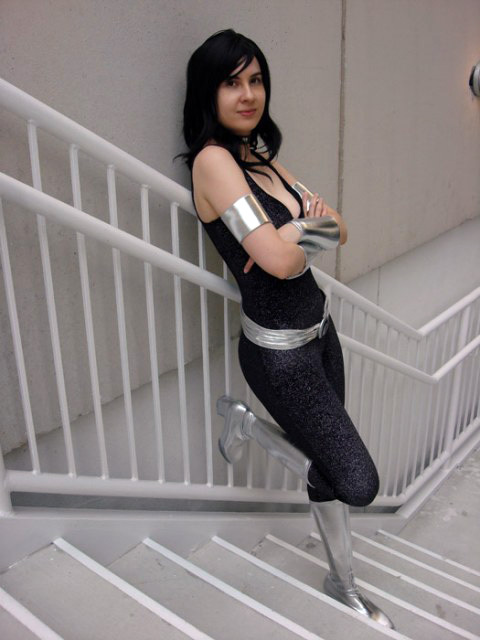 I used silver metallic spandex for Donna Troy’s belt and to cover the bracers. 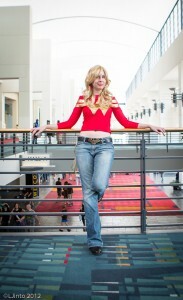 I used a metallic stretch denim for Clea. The finish on the fingers of the gloves started wearing off after wearing it once. 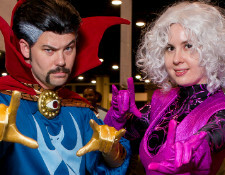 So, Clea is not a costume I plan on wearing many times. Metallic stretch vinyl needs to be stored and handled carefully. Creases can form easily in folded stretch vinyl and damage the fabric. I used gold stretch vinyl for the Ws on my top for Cassie. Holographic spandex seems sturdier than metallic to me, however holographic finish can crack. Subtle cracking does not seem very noticeable to me. 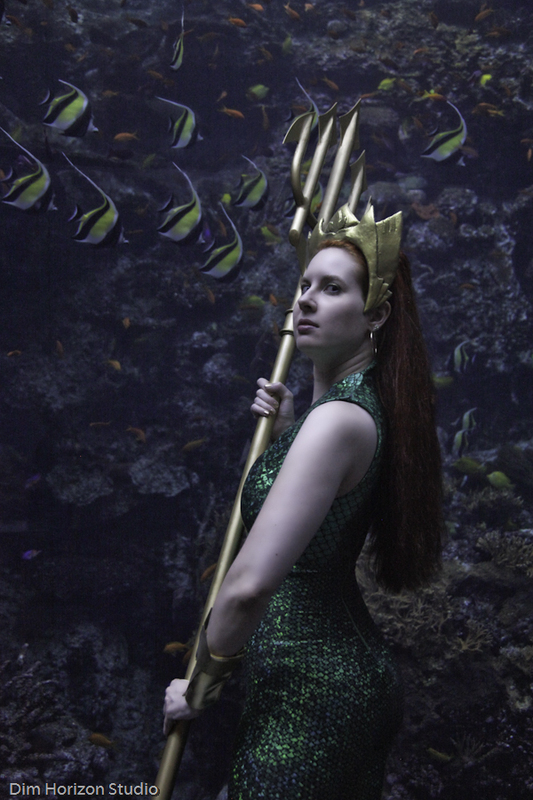 I used holographic fish scale spandex for Mera. Stretch velvet has a nice weight to it at 8oz/square yard. You need to pay attention to the pile with stretch velvet. The velvet will be smooth in one direction and rough in the other. You want the smoothness of the pile of velvet to go in the same direction. Pay special attention to how your patterns are laid out on your fabric in accordance with the pile before cutting out your pieces. So if your want your velvet to be smooth going downwards make sure your pattern pieces are with the pile going smooth from top to bottom of each piece when pinned on. You may need more fabric than normal for a project to account for the pile of velvet. I used black stretch velvet with silver glitter for Donna Troy. When in doubt about about the qualities of a spandex always order a swatch. Spandex World charges small fees for swatches. Aside from examining qualities like stretch, finish, and weight I also like to get swatches so I can see how the colors look in person. This entry was posted on February 21, 2014 at 4:11 am. You can follow any responses to this entry through the RSS 2.0 feed. Both comments and pings are currently closed.